For us, this dish is a fall and early winter favorite. Usually we make it after going to our favorite apple orchards or picking our own apples. It is super easy to make, basically slicing, chopping and baking. It is also a good way to use up some of your damaged “ugly” apples. We use a 5 qt “everyday pan” or 6 quart deep skillet for this. 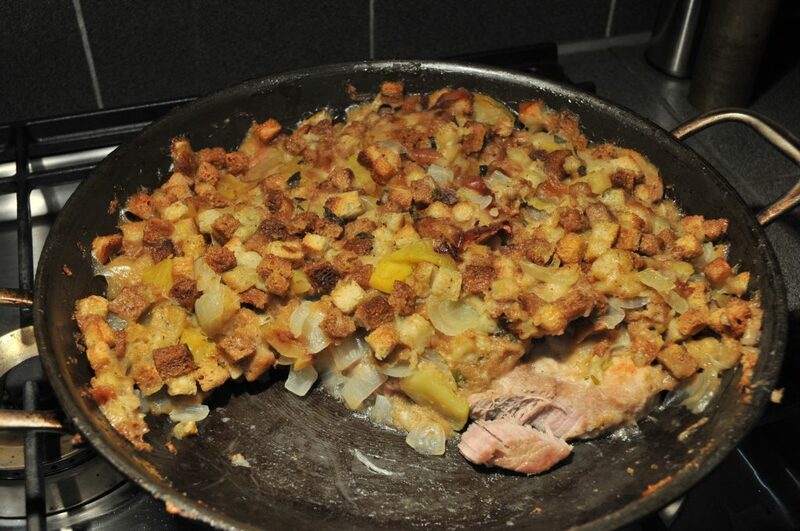 You want a covered pan that is a bit on the deep side to contain the stuffing on top of the pork. The stuffing will shrink down by half while it bakes. It would also be interesting to try in a dutch oven over a camp fire. 2 lbs pork roast. We use the smaller rib end toasts which have a bit more fat and break down better than a pork loin roast. You can substitute pork loin roast or boneless pork chops or pork tenderloin (cut cooking temp and time). Exterior fat is trimmed off and the meat is sliced about 3/4″ thick. This should yield about 8 slices. Each slice is one serving for us. Dredge in flour – about 3/4 c with a good grind of pepper, 1/2 tsp granulated garlic and a bit of salt (1/4 tsp). Brown well on one side in bacon grease and lightly on the second side. leave the lightly browned side down when adding the stuffing. This dish is one of the reasons we save our bacon grease. 1 fist full of fresh thyme and 10-12 leaves of fresh sage chopped (if dried about 1 tsp thyme and 1/2 tsp of sage) but this dish is one of the reasons to grow your own. Bake covered 90 min at 350F. At 60 min pull it out and turn over the stuffing so the top does not dry out. Pull the cover off for the last 10-15 minutes to let it brown a bit. Teal has reminded me that the pan needs to go on a jelly sheet pan or cookie sheet to catch the inevitable dribbles of juice that otherwise makes a mess of the oven. Serve with the same wine you used to cook it (unless it has magically disappeared in the meantime). The pork will be fork tender. I like about a dozen rinsed capers on my slice. This will serve 8. A small side salad is nice. Of course, apple crisp is the favored desert. For those of you that live in Wisconsin, my favorite orchards are Ski Hi and Brighton Woods with Aepple Treow winery as well as my back yard. Teal loves Orange Chicken and Lemon Chicken. However, the breading and frying is a pain as well as adding un-needed calories. So here is a way to get the delicious flavors with much less fat and calories. Take 2 packs boneless/skinless chicken thighs (8 thighs). Throw these directly on the grill. These are cooked on medium high heat to give some caramelization and melt off the fat. Pull from the grill when still somewhat pink in the center. You don’t need to have them cooked completely through as that comes in the next steps. This is so much better than trying to trim the fat and cube the raw chicken. Now cut into bite size pieces. Mix the corn starch into about 1/2 c of the mixture from above and then add into the rest. If you try mixing into the big batch directly you will get lumps. The small amount lets you whisk out the lumps. At this point, it will look like you have too much sauce and it seems to be too runny. Don’t worry, it will cook down and thicken. 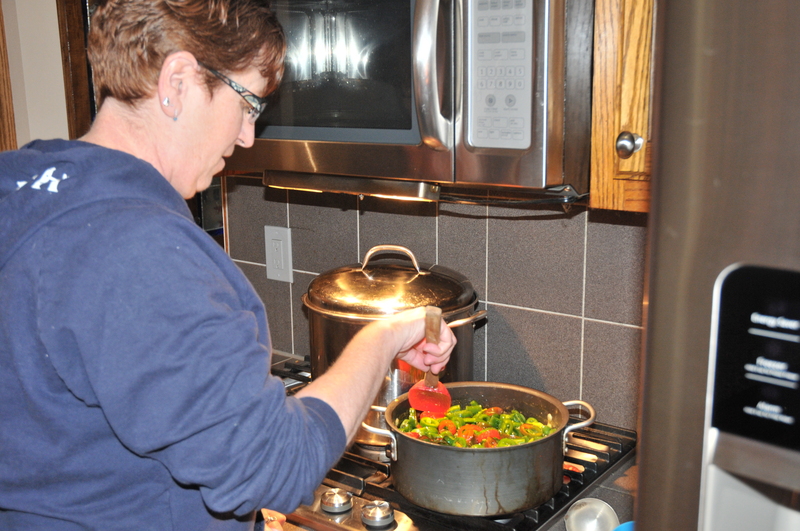 In a 13×9″ glass pan place the chicken and then pour the sauce over the top. Bake for 2 hours at 325 F . Stir every 30 min for the first hour and then every 15 min thereafter. When you stir be sure to scraped the caramelized crust from the edges. If you leave this browning goodness it will burn and make clean up more difficult rather than adding to the flavor. Serve over rice with a side salad. I add some blood orange hot sauce and tamari sauce for mine. This makes great leftovers. So don’t hesitate to double the amounts. Last year, was our first try making these treats. They were an instant hit. However, with only 12 half pints we had to conserve the supply for family gatherings and parties. Even people that are not pepper aficionados will go for these (except for my wife Teal). The original recipe from Foodiewithfamily.com was modified somewhat. Our favorite way to enjoy them is with cream cheese or mild cheddar and crackers. Some of you may think this similar to the pepper jelly cream cheese and crackers that was popular in the 70’s. So this year we set out to make a lot more. I planted a good supply of peppers of various types (Jalapenos, Big Jims, corno di toro, and caribbean reds) and then let them ripen. However with a dozen plants this was not enough. So yesterday, I went to the Waukesha farmer’s market early and bought out a couple of the vendors. Each batch requires 3 pounds stemmed and seeded, approximately 3.5 to 4 lbs whole. We overbought – next time I will bring a scale. 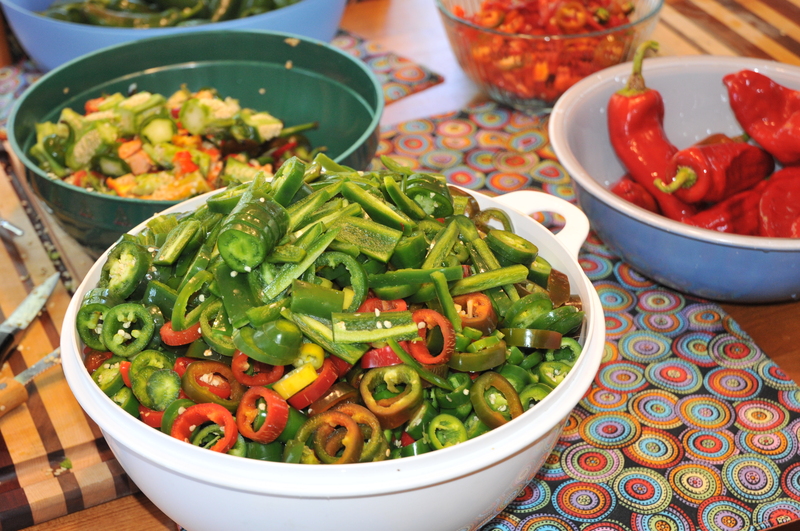 Ideally you will have 1/3 – 1/2 ripe red peppers and the balance being green jalapenos (or serranos if you like more heat) . This photo shows about 10 lbs. You can double the batches without problem if you have large enough kettles. Each batch will have left over liquid which you keep using, just add to it to replenish. Every 3rd batch or so, we skip adding more liquid. Use pH test paper to make sure it is still in the sub 4.5 range, if not using pH paper , keep adding half as much vinegar on the “skip” batches to make sure it stays safely acidic. Wear gloves, otherwise after handling several batches of peppers, you won’t be able to touch any sensitive areas for better than a day. 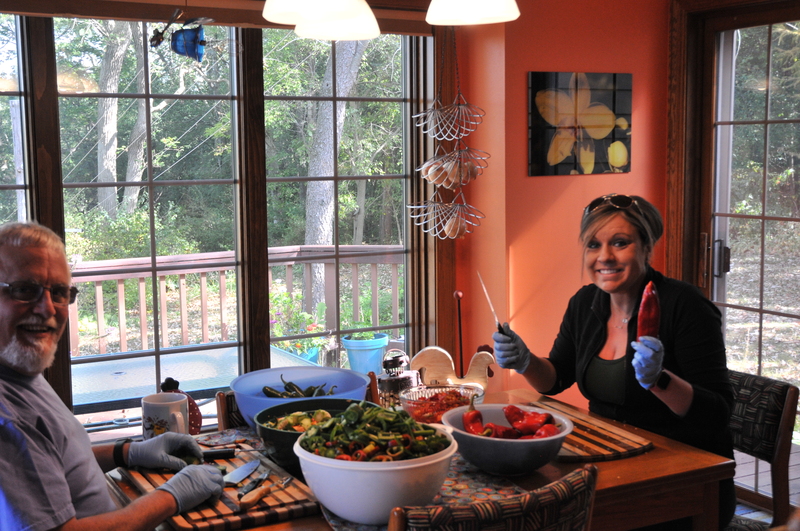 To prep the peppers there are 2 methods that we use. 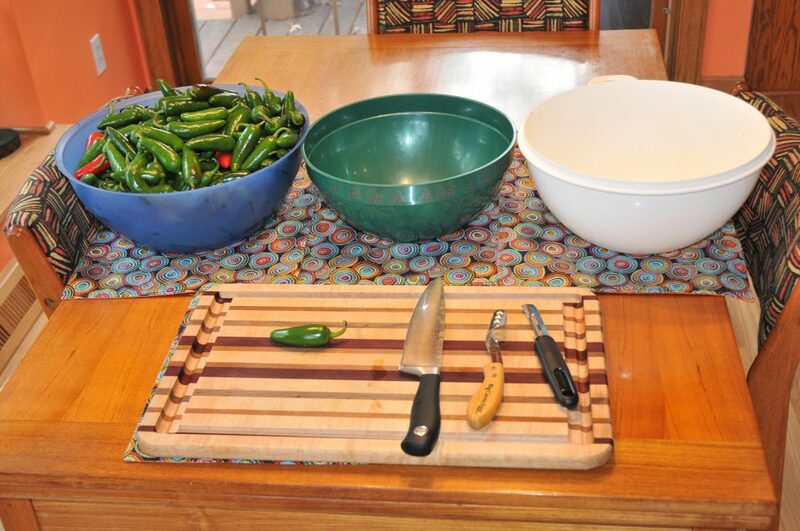 You can use a corer (like the Big Green Egg Jalapeno corer) or modify one of the cheap ones from the grocery store. This allows you to and pull the seeds and membranes out if they are large and then slice. However this really only works well with very large peppers. A better way is to start slicing from the pointy end and then pause when you hit seeds. 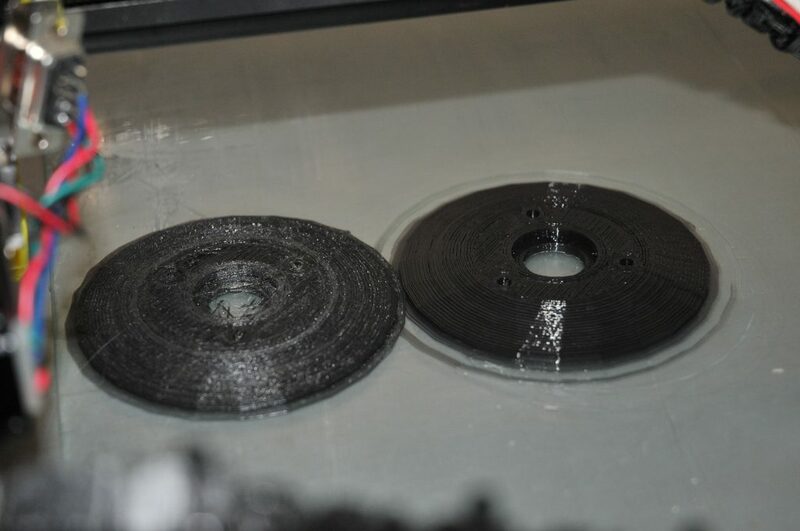 1/8 to 1/4″ wide slices. Now slice off the stem end. Stand the pepper on one of the cut ends and now start slicing vertically shaving off strips the same width around the seeds. The second method is not only faster, you end up with a lot less seeds mixed in with your peppers. I am not a fan of the bitterness of the seeds and membranes. I think this is one of the keys to having great tasting results. We did a comparison to some commercially made candied peppers that were merely sliced with the seeds left in and ours won the flavor comparison hands down. 3 lbs seeded and sliced peppers (1/8-1/4″ thick slices or strips). We include 2 habaneros per batch for bit more heat and flavor. Weigh it out! In a large pot, mix all of the ingredients except the peppers. Bring to a boil. Boil for 5 minutes. Watch carefully as it starts to boil as it will boil over easily (like jelly, and make just as much of a mess). Add the peppers and bring back to a boil. Once boiling, boil for another 4 minutes. Each batch makes 3 pints or 6 1/2 pints. Boil your jars, lids, and utensils (slotted spoon, ladle, funnel). 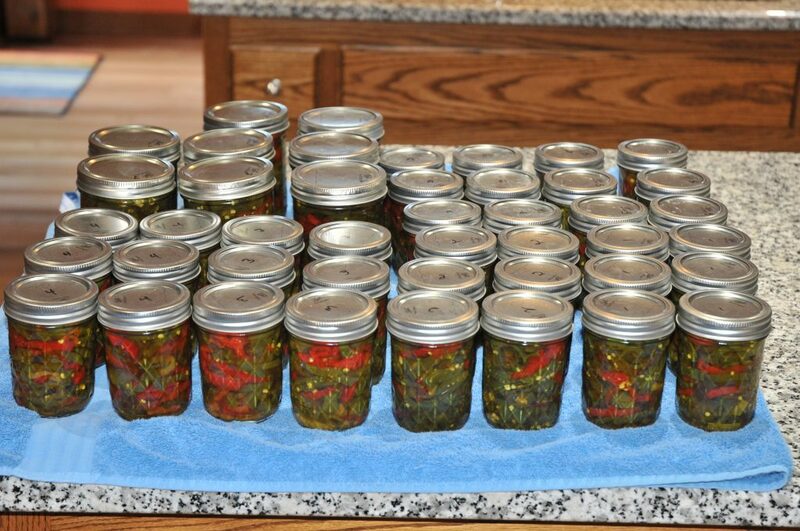 Using a slotted spoon and a canning funnel, fill and pack the jars with the peppers. You will need to pack down the peppers a bit. Boil the liquid to reduce for 6 minutes. Ladle into the jars . Use a poker to work out any air bubbles. Add more liquid leaving 1/4″ headspace (maybe more like 3/8″). Put on the lids and bands. Process in boiling for 10 minutes for 1/2 pints and 15 minutes for the pints after it returns to a boil. Remove from the water, re-tighten the bands and set aside to cool. These should sit for a month before using. Today we made 36 half pints and 8 full pints (one lid blew off in the water bath otherwise we would have 9). This took about 6-7 hours. All times start after hitting a full rolling boil. This recipe is not a complete guide to home canning. For more info look up info from various University extensions such as: https://fyi.uwex.edu/safepreserving/recipes/ or get the Ball Blue Book of canning.